Tai Chi VS Silat. What’s the Difference? We often talk about the differences between Tai Chi, Hsing-I and Bagua. Hsing-I moves forward in waves like a sine wave or water rolling in to the beach. Bagua moves more like a gyroscope or/& a spinning sphere within a spinning sphere. Tai Chi moves more like a large ball that can expand or deflate instantly from the inside & outside. Well that’s a little tougher. Unlike Tai Chi, Silat isn’t a single art. It’s a whole category. So it really depends on which type of Silat you compare it to. Tai Chi is usually much﻿ more concerned with health in the beginning. Silat usually starts with survival first. Tai Chi uses very refined structure. Some Silat will throw structure completely out the window. Tai Chi will tends to use a very calm quiet mental & body state. Keep in mind that with a category as big and diverse as Silat there will always be exceptions to the rule. For example, our Clear Defense method is straight up Kuntao Silat. The method also prevents someone from having the error of double weighted and every bit of movement is found throughout the Tai Chi form. …and, though the method is somewhat rigorous, we’ve successfully taught it to 60 & 70 year olds who were not in very good shape. In this case the only thing that really makes Clear Defense a Silat method is the attitude. Because this method is designed to be learned quickly, students use a very aggressive mind state. We find the aggression of Silat much easier for beginners to use effectively in an attack, While the calm peaceful mind state of Tai Chi takes a bit longer to develop well enough for use in life and death situations. 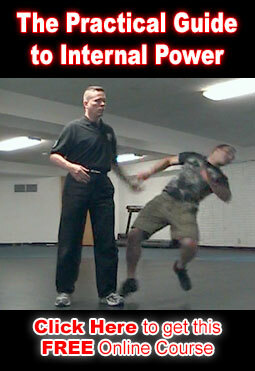 Learn this method at our Clear Defense Certification Workshop in July. You can also get the Clear Defense Instructor DVD Package.